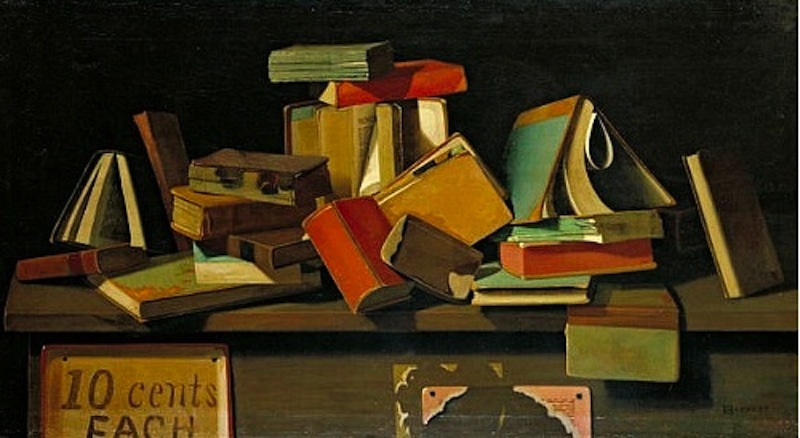 Last week’s post included pieces by William Harnett (1848-1892) and John F. Peto (1854-1907). Here we take another look. For many years their unfashionable work was thought to be by the same person, but there are lively differences between them. Detail decisions make a huge difference in results. Harnett aims for the trompe l’oeil (“fool the eye”) effect. His colors are naturalistic, his tonal distinctions subtle and minutely observed. Peto is bolder and less literal. He doesn’t model as realistically as Harnett does. He doesn’t use highlights, so his principal tones don’t have to be held down to preserve contrast. His colors are brighter, his shapes flatter, his tonal gradations more abrupt. His shadows are harder and constitute positive shapes in themselves rather than merely evoking the decaying of light: compare the shadow cast by Harnett’s projecting piece of paper with Peto’s projecting books. Peto’s effect is not so much one of objects lovingly observed but a lively, almost abstract pattern of shapes and colors.